It’s Throwback Thursday so let’s go back through Upper Deck’s trading card history and come up with a fun giveaway. This weekend is National Hockey Card Day in the USA and with all the positive response we received from Canada’s promotion last week, we are more than excited to head into the weekend. 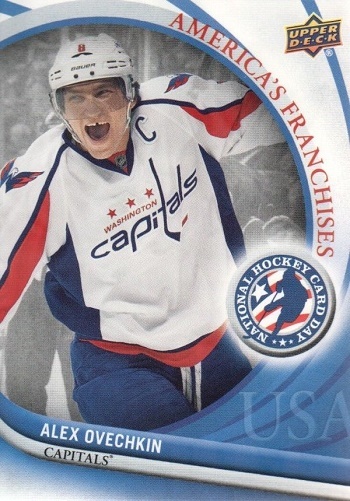 One of my favorite cards is from the 2011 NHCD set of Alex Ovechkin from the Washington Capitals. So let’s put up his throwback card and see if our fans can come up with some great captions for the card! Please share your comical caption to this card for a lucky fan’s opportunity to score 5 packs of this year’s National Hockey Card Day USA set! You have until Friday morning, February 20th at 8:00 a.m. PT to post your caption before this promotion is closed. Upper Deck will review the captions posted and select one (1) fan who most skillfully shares a comical comment to coincide with this card. 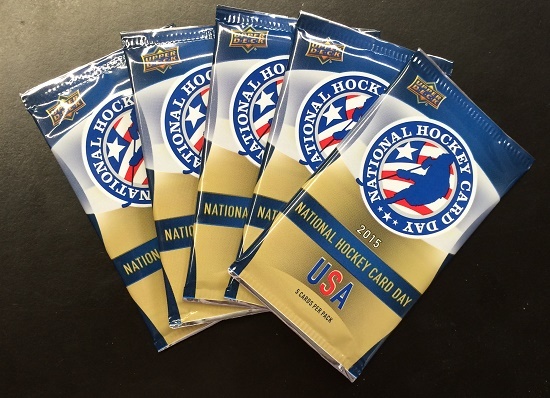 2015 National Hockey Card Day USA Packs! Booyah! Victory Is Assured Boys When I have the puck! I give Malkin wedgie! Ha ha! I finally won a car! Hey I’m flyin on the ice!!! I just went to the potty all by myself. I’M A BIG BOY NOW! Look Mom. I lost a tooth. Woot Woot, the Tooth Fairy is coming, the Tooth Fairy is coming. The reaction when the tooth fairy leaves you some Upper Deck hockey cards under your pillow. Ahhhh Honda gave me a car! When you score you don’t have to back-check! Im having a free UpperDeck card party! Like a fat kid in a candy store! The ferocious Ovinosaur closes on another unsuspecting goalie. OMG I can’t believe that he fell for that and I scored! You don’t have to brush all your teeth, just the one’s you want to keep. 2011 – 300 career goals – 600 career points – 1st fighting major……lots to celebrate!!! Hey, Mom – all those years of getting up to drive me to hockey at 4am have paid off nicely!! I’d give my front teeth to participate in National Hockey Card Day!!! All i want for playoffs is my 1 front tooth!!! My dad is the Geico caveman. OMG I just found out they are roasting Justin Bieber!!! Teeth aren’t a requirement to succeed on the ice! IT LOOKS LIKE ANOTHER GOAL FOR ME COMRADE! I JUST GOT SOME NATIONAL HOCKEY CARD DAY PACKS! I am the captain! You must listen to me! heeeeyyyyy you found my tooth, yay! Put me on the front of a cereal box, I’m Grrrrrrrrrrrr-Eight! Woo hoo, let me at those free packs. I’m so excited that my stick is on fire. Letang who? I was going for the puck!!!!! YEAH! I made it on to a NHCD in America card! They still don’t know I’m a Russian spy!